I only gave two big handmade gifts this year (fear not, the other one got tickets to see the men in green chasing a wee oval ball around Wembley in September) Anywho, for my mum I decided to make a weekend bag using some fabric I grabbed in Mandors back in February during a meet up with some local bloggy friends. It’s a polyester/cotton blend (I think it’s Fryetts Balmoral range) which is heavy-weight home decor fabric, a lot like the Moon wool range, but without the eczema side effect that wool gives me. I paired it with some faux leather, lined it with some upholstery linen for the main lining, and some natural cotton for the outer pockets. The lining has inline pockets on both sides, and a zipped pocket too. 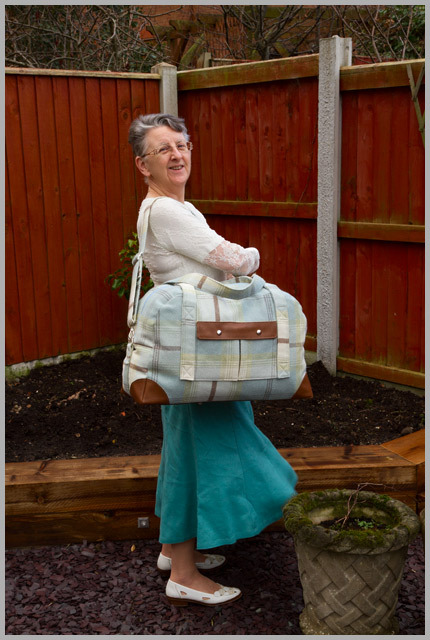 It’s the right size for cabin baggage, as well as useful for taking to a wee weekend getaway, and I’m hoping to have a pattern written up soon. Looks like a brilliant roomy bag! What a great bag, Katie! I bet your mum loves it. 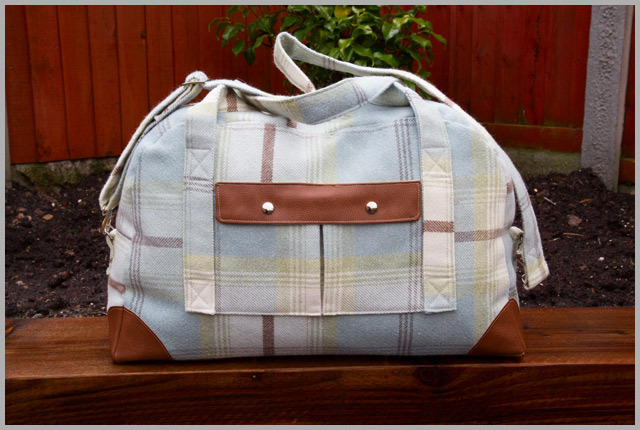 I have been wanting to make a bag like this for awhile, so will wait patiently until your pattern comes out. I hope you and your family had a wonderful Christmas! 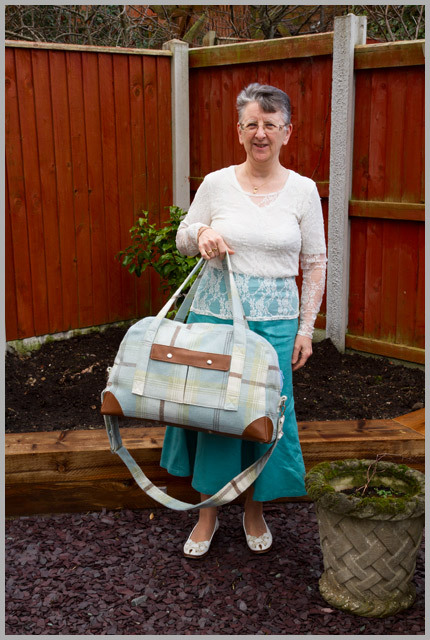 Super bag, love the size – not to large, not to small. I would imagine there even would be room for a wee little bear or two…….. Thank you, I imagine there would be room for quite a hug in there! Great bag and clearly a perfect Christmas gift! what a great bag, Katy. It's perfect in every way. I do hope you'll write up the pattern as I'd definitely love to make one. Lovely bag! Can't wait to see what it looks like on the inside with your pattern. Been seeing a lot of bags lately and it's making me antsy to catch the bag bug myself! Lovely bag! Perfect for a weekend getaway! That's a cracking looking bag!!! And your Mum's a wee sweetheart modelling it. A super bag. 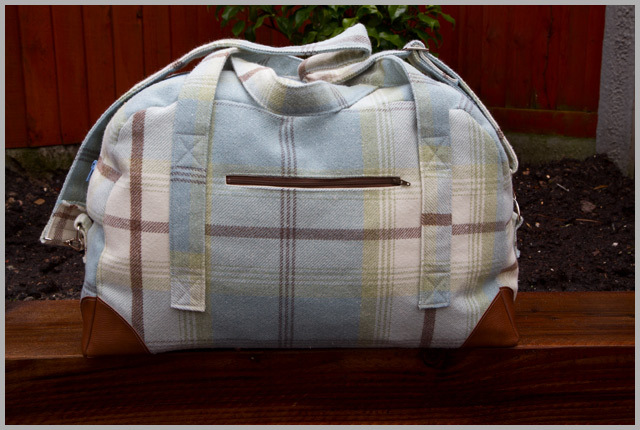 Just right for a weekend or cabin bag. Big enough to take a little friend with you. The bag is perfect and think of all the Christmas cake and sweets she can bring you when she visits. goodlooking bag and goodlooking model! The bag looks really well, the wool fabric looks so tactile. The details on this bag are great! I'm excited to hear you're working on a pattern too. Oh, that's such a handy size. I can see this doing really well, Katy! That is the most stylish bag, beautiful fabric, and the leather detailing is brilliant. Excellent modelling by mum too! So awesome! And it looks like it was a huge hit with your mom!